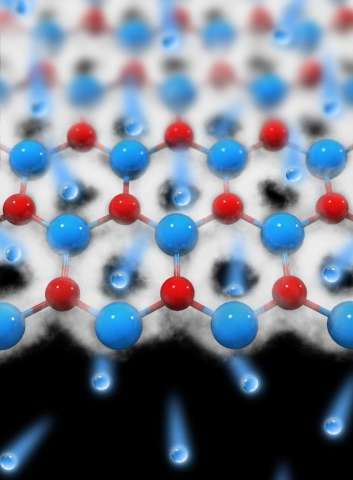 Dr Marcelo Lozada-Hidalgo, University of Manchester postdoctoral researcher and first author of the paper, said: "This is really the first membrane shown to distinguish between subatomic particles, all at room temperature. "Now that we showed that it is a fully scalable technology, we hope it will quickly find its way to real applications." Professor Irina Grigorieva, who co-authored the research, said: "We were stunned to see that a membrane can be used to separate subatomic particles. "It is a really simple set up. We hope to see applications of these filters not only in analytical and chemical tracing technologies but also in helping to clean nuclear waste from radioactive tritium." Now that is surprising (and a great find). I wonder if there are other monolayers with different cell sizes that can effectively filter isotopes like C12 from C14 or spearate out radioactive waste from contaminated solutions. Hey, maybe it would provide a cheaper, easier way to separate U-235 from U-238!